with 'mini me' bull calf CER El Patron! SOLD. RO Pretty Penny’s DOB is 12/15/14 and she measures 63” TTT (09/11/2017). Ross Ohlendorf told us that “Pretty Penny was one of the biggest calves we have raised in a long time, and she is going to make a huge cow!” They are very excited about her bloodlines and now have a wonderful calf out of her full sister for whom they have high hopes! 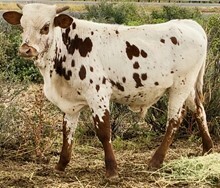 She is a very pretty white with red spots cow who is always friendly and curious, Penny knows her name and regularly comes to the fence to say “Hi!” She is exposed to our bull CER JR Admiral Rattler who descends from an impressive pedigree to include 585 Overwhelming Toro, FIVE time World Champion!!! On 5/4/2018 RO Pretty Penny and CER RJ Admiral Rattler produced a stunningly beautiful image of herself, CER EL Patron (5/4/2018). Like his mother El Patron is beautifully made and wildly colorful. El Patron knows his name and has happily come to the fence to visit (even when way out in pasture), like his mom, since he was born! We have good reason to hope that he will also inherit her huge horns! El Patron will one day make an incredible herd sire! SOLD. We are happy to congratulate and thank Dr. Hamid Saadatmamesh on the purchase of RO Pretty Penny, one of our all time favorite girls! We know she will contribute great genetics and a sweet nature to their herd at their ranch in New Mexico!